Last time I went to The Grove to watch people not buy my book, which was so much fun I was looking forward to it again. 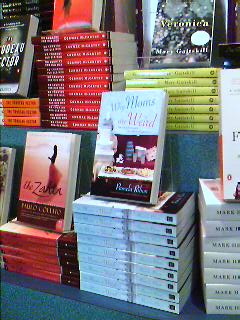 Well, this time my book’s on a table on the third floor, and the front table holds a bunch of books about Harry Potter or Rachael Ray. So it isn’t as easy to spy. I took this picture at a store in the valley, where the book was right next to the register, which means if I wanted to watch people browse the book, I’d pretty much have to get a job there. I couldn’t find it at the Virgin Megastore. The Barnes and Noble near my house had a nice, healthy stack of them, and offered to move it to the local author section of the store. It’s a little stressful. The sales are going well, and the reviews have been positive — (“Ribon excels at romantic dialogue. The exchanges between Benny and her two romantic suitors Zack and Mickey are fresh, funny, real and charged with romance and desire.” Hey, thanks, Romantic Times!) — but it’s still stressful. Everything is stressful, and I’ve been having nightmares. Pretty bad ones, where my mom’s in peril, or I’ve done something terribly wrong and can’t fix it, or I’m running from bad guys and I’ll have dreams within dreams to the point where I no longer know if I’m awake or not, know what I imagined and what really happened, or where I am in the morning. It’s exhausting. I also alternate from not getting enough sleep to getting so much sleep I need to keep sleeping in order to feel like I’ve slept enough. Oh, wah. Whatever. Ignore me and my whining. I’m fine. Honestly, I don’t know what else to write about these days. The book is out, I’m working hard, life is complicated, there’s a lot going on in terms of responsibilities and expectations and obligations and I’m worried about six thousand things, most of which have no business being discussed in a public forum. I am literally one thousand emails behind in answering email. I’m just overwhelmed. Dan and I are both feeling out of control and busy. This is what prompted Dan to write an entry about his cats, and I’m writing an entry where I tell you I can’t seem to come up with entries. I don’t know what else to say other than I’m sorry.